Looking to increase your business reach in your local area? Use these search engine optimization (SEO) techniques, tips and tricks to improve your local SEO and have customers banging down your door in no time! There are a lot of tools out there that will help you find the right keywords and phrases to target your customers. Using the Google Keyword Planner, you can niche down your search to just the areas you want to target, then type in a keyword or phrase you want to rank for. You’ll see a lot of variations of that keyword, and how many people in your local area have searched for them. Not only that, it gives the keywords a “competitive score”. You’ll want to find keywords that a lot of people are searching for but have a “Low” rating for competition. Make sure that you type in multiple variations of your keywords. Maybe your potential customers are searching for Northeast PA, or Maybe it’s Northeastern PA, or Northeastern Pennsylvania. These variations may seem silly, but finding the appropriate wording your target audiences uses to find businesses like yours makes all the difference. Add map to the footer - seems to help somewhat. Not a *big* jump but definitely a boost. Add map to the contact page along with the address - this helped the most in our testing. Add map to any other page - no effect in our tests. Of the 14, the 2 controls and the 2 “any other page” had very little improvement. The 8 using a map on the footer or on the contact page (with address) had definite [upward] moves [on Search Results pages]. Putting the address on the page, along with an embedded G map was by far the best result from their testing. Best practices today say that you should create separate landing pages for local locations you want to target, then drive traffic to these super relevant pages using keyword optimization or even Adwords. Use your company name in combination with your keywords when possible. For example, my company name is Bullzeye Design. Whenever possible I use phrases such as “Bullzeye Design Website Design and Development” or “Bullzeye Design Band and Music Flyers” - any way you can combine your company name with your services will be helpful. You offer customers an 800 number for customer service, but that doesn’t help a search engine crawl for your location. Use your local phone number, with the area code, to help the engines connect you to local searches. If your business doesn’t have a street address, rent a post office mailbox. Renting a box can give you a street address and will make you start appearing in many more online searches, nearly overnight! Consider choosing a store location that’s easily found using a mapping website such as Mapquest.com or Google Maps. If those mapping utilities can pinpoint your address location, it will help with your rankings. Mention the obvious - Describe your business, services and products in detail. This may seem like common sense, but eliminating copy that is very keyword intensive will hurt your rankings. Search engine users are looking for information and solutions. They will only find you if you provide them with the information and solutions they need. Again, blogging is a good way to expand on your products and services using multiple posts. If your keywords are “Business consulting, Scranton, Pennsylvania” and then title your page with “Amy’s Advice Website” you are not using search engine capabilities to your best advantage. It’s more effective to create a page title and header that coincides with your keywords such as, “Scranton Pennsylvania Business Consulting”. A great way to increase your search engine ranking is by gathering inbound links to your website from reputable sources. This means local business directories, chamber of commerce, yellow pages, any local magazines, etc. that pertain to your field. I recently wrote an entire article about increasing SEO using inbound links. It’s not specific to local SEO, but these principals can be applied on a local level. The consistency of name, address and phone number (NAP) on local business listings had a 16% influence in determining performance! Google also places value on consistency throughout local listings for business. If there are discrepancies between your business listings on different directories, your business results will rank lower because it can hurt the user’s experience. Wesley Young studied the impact of various factors on local search performance and found that the consistency of name, address and phone number (NAP) on local business listings had a 16% influence in determining performance! Experts said that factors related to Google Places (now Google My Business) listings including the following items had a 19.6% influence in determining local search performance. This may sound like a difficult task, but often times, updating and adding new content to your website helps you gain better search rankings and will help with your local SEO. It’s helpful to update the content of your pages to better reflect your keywords and phrases, or add new content and unique descriptions. If you like your website the way it is, and don’t have the flexibility to change it frequently, it might be in your best interest to start blogging. By using a blog, you can update the content regularly which will help with your search engine rankings. The more you write about a subject, the better it is for your SEO (Search Engine Optimization). For example, if you own a dog grooming business, you can come up with countless articles related to dog grooming. How, you ask? First, you can start off by writing about your business and location, how you groom the dogs, and about your staff or facility. After that, perhaps you can write about different situations you’ve experienced throughout the week. Maybe a dog came in that was sprayed with a skunk, or you helped a local shelter at their ‘doggy wash’ fundraiser. You can use these little stories and anecdotes to write an article in your blog — be sure to pepper the article with your keywords, and you are good to go! Writing regular blog posts and news stories helps get the attention of Google. Try writing about a local event or local resources, too. 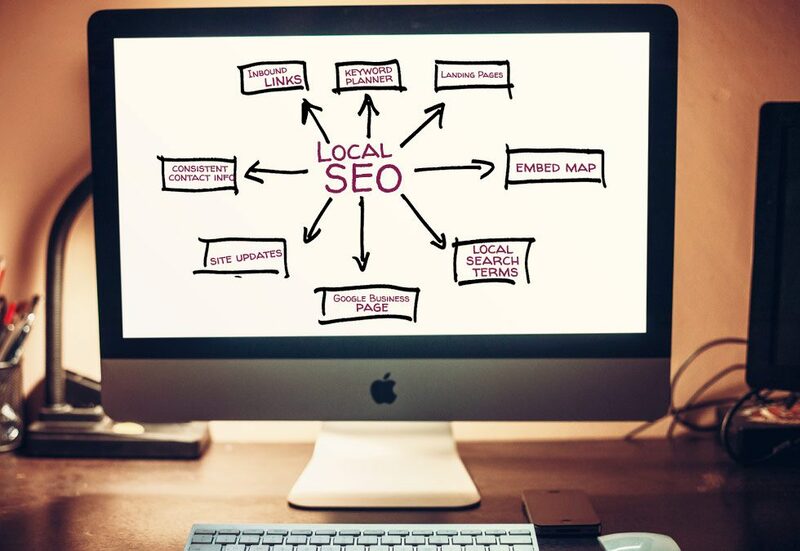 There are a lot of ways you can give your business a competitive edge in the Local SEO market. Submit your site to local directories and make sure you are consistent with your name, address, and phone number. This will create inbound links which are helpful in SEO and being consistent lets Google know that you have dotted your T’s and crossed your I’s. Be sure to embed a Google Map on your contact page (along with your address), too. Another way to increase local SEO is to create a Google My Business page and optimize it properly. Landing pages that are targeted toward specific geographical areas are also useful in attracting the locals. Make sure that you are using relevant keywords on these pages; within the copy, as the page title, the meta description, and even the page slug, or URL. Finally, updating your website with relevant content using a blog is a great way to show Google that you updating your site regularly and are an expert in your field. Want even MORE tips? Download my free step-by-step SEO Guide that will help you get started. Local SEO does not happen overnight. But using these techniques should yield results over time for your business. The sooner you get started, the sooner customers will be rolling in! What are some ways you use to optimize your website for your local area? What has worked for you? What hasn’t? Comment below, I would love to hear your thoughts on this interesting and ever-changing subject.